Note: The full text of this important paper is unfortunately not yet available. 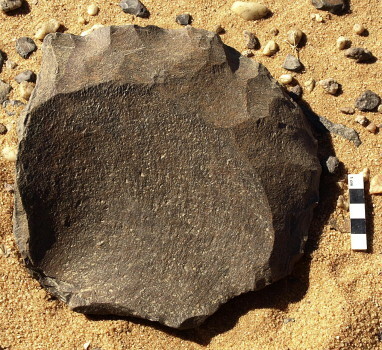 Abstract: Research conducted since the 1990s in SW Libya has provided wide-ranging data on the Pleistocene archaeology of this vast region, which principally relies on surface scatters of lithic artefacts, a series of soundings and two MSA/Aterian dated sites. The Middle Stone Age of the region is thought to date from roughly MIS 6/5 to approximately 60 ka (the latest dated Aterian occurrence). Its distribution varies from sand seas to mountain ranges, with different states of preservation and archaeological visibility. This paper presents data from the last surveys (2010–2011) carried out on 46 transects across the Messak massif. One component of the research strategy was specifically designed to handle the impressive Pleistocene record through sampling a series of spots placed at fixed distances along predetermined survey strips. Field documentation of the techno-typological traits allowed the creation of a territorial data-set used to infer patterns of raw material exploitation, technological variability and the significance of the principal chrono-cultural markers. Quartzarenite, the most available and used raw material, is a diffusely distributed resource. This should have played a role in patterns of land use and mobility and, ultimately, in the composition of archaeological assemblages, mostly characterised by complete reduction sequences. Variability in the application of the Levallois method highlights widespread adoption of recurrent and lineal schemes. Among the latter, point production is extremely rare. The retouched blanks inventory is dominated by scrapers and notches, whereas more specialised tool classes (i.e., tanged pieces, points, foliates) are less common. The dimensions of a small sample of Aterian artefacts provisionally signal a higher degree of homogeneity among pointed tanged specimens than other types. Despite the overwhelming presence of roughly labelled MSA contexts, these show little evidence of a MSA stricto sensu chrono-cultural signature, among which scanty but precise elements are comparable with the sub-Saharan and Nile valley early Middle Stone Age, reinforcing the picture of multiple dispersals across the Sahara and North Africa around MIS 6/5. The evolution of MSA occupation and its cultural trajectories is difficult to assess, while the last phases, represented here by the Aterian, can be framed in hyperarid MIS 4 – after the dates from Acacus – and likely represent the adaptation of residual groups almost confined to mountain environments.